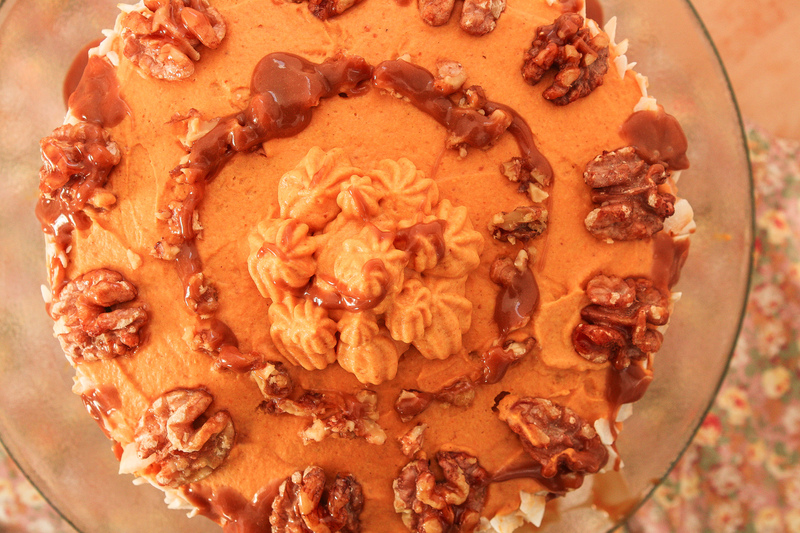 Today’s recipe is a decadent Vegan Gluten-Free Pumpkin Cake with Caramelised Walnuts! 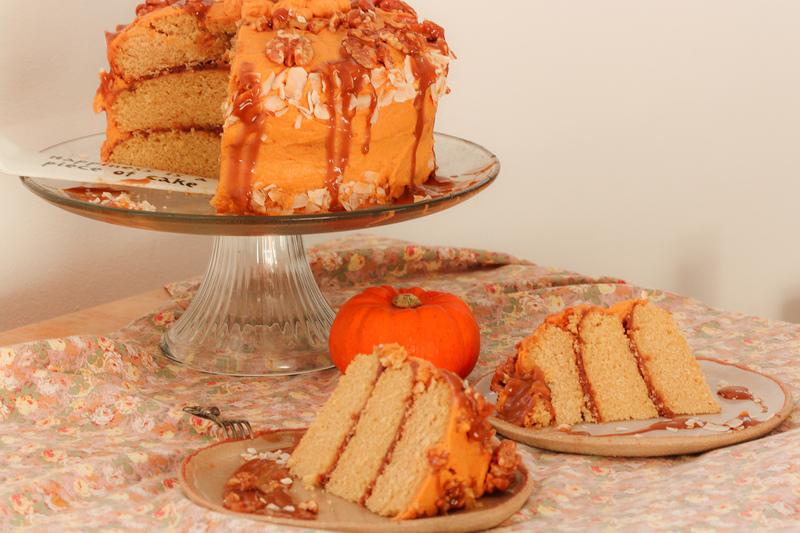 The pumpkin season has arrived and with it all its different recipes! From pumpkin soup to pumpkin mousse and pumpkin bread! Having a very sweet tooth I was tempted to have my first pumpkin of the season as a frosting for this Vegan Gluten-Free Pumpkin Cake with cinnamon, nutmeg and caramelised walnuts. This Vegan Gluten-Free Pumpkin Cake is my entry to PETA UK Great Vegan Bake Off 2018, which ends on the 1st October. I wanted to make something that everyone would be able to enjoy, with no dairy, but also no gluten or refined sugar. For those of you who do not know what PETA does, they are a “based charity dedicated to establishing and protecting the rights of all animals”. Not only decreasing your intake of dairy will do good for the animals, it will also do good for the environment and your health! coconut whipped cream with pumpkin puree and a touch of cinnamon and nutmeg. a caramel made out of dates. Some caramelised walnuts for an extra crunch and a drizzle of Lotus Speculoos spread. The gluten-free sponge is soft and light made with rice flour and almond flour. When baking with gluten-free flour I recommend you use more than one type of flour for a beautiful batter. Rice and almond flour combine very well in this recipe. I am so excited to be taking part in the Peta Great Vegan Bake Off with this decadent yet easy to make Vegan Gluten Free Pumpkin Cake! 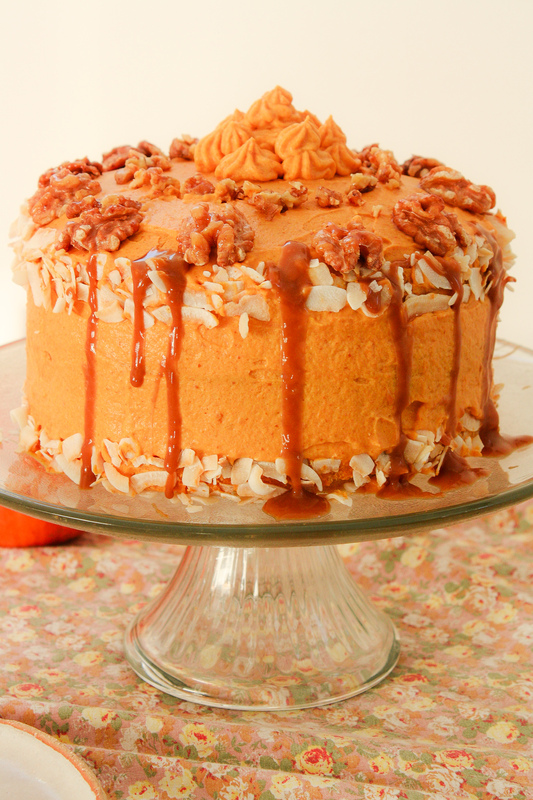 I hope you try and like this Vegan Gluten-Free Pumpkin Cake if so let me know! Share on Pinterest and tag a photo on Instagram #mimies_delicacies so that I can see your lovely creations as well as helping me reach more of you lovely people. Merci my friends! 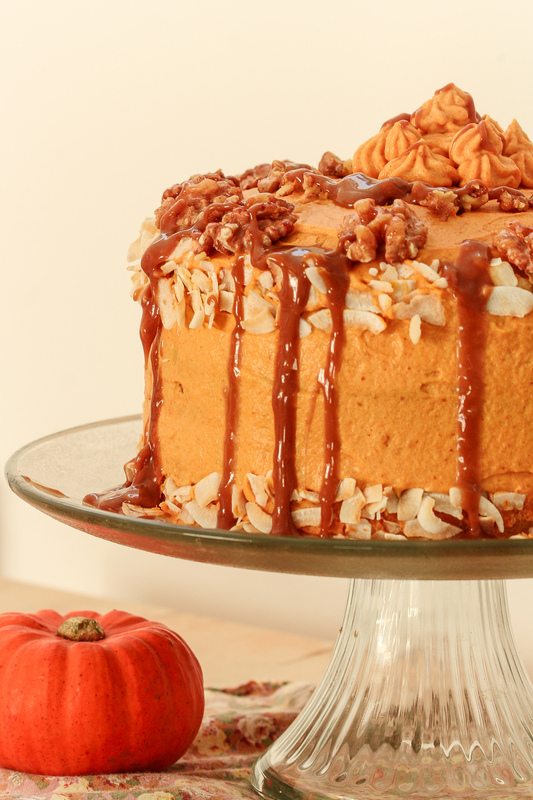 This triple Vegan and Gluten Free Pumpkin Cake is a real treat with its smooth and creamy coconut and pumpkin frosting. Pre-heat the oven to 180 degrees Celsius/350 degrees Fahrenheit. Line a 22 cm by 22 cm cake pan with parchment paper or simply grease with some oil. In a bowl, pour the dairy-free milk, add the apple cider vinegar and leave aside for 10 minutes. Next add the rapeseed oil, the vanilla extract and mix. When the mixture is all combined add the wet ingredients, mixing well until it forms a smooth batter. Pour the batter into the cake pan and bake for 30 minutes or until golden brown. Place the medjool dates in a bowl of warm water for 10 minutes to let them soften. More time may be required if using another type of dates. Next, chop the dates and mix in the food processor with some of the water it rested in until it reaches a thick paste consistency. Add a pinch of salt and mix again until well combined. Place the coconut cream or coconut milk into the fridge 4 to 6 hours before making the whipped-cream (when using coconut milk remember to get rid of the water left behind). Pop the whisk of your electric mixer in the freezer 10 minutes ahead of time. The colder the easier it will be to achieve a beautiful whipped cream! In a large bowl pour the coconut cream/milk along with 1 tbsp. of superfine cane sugar. Whisk for 30 seconds while gradually increasing the speed of your mixer. Incorporate the rest of the sugar 1 tablespoon at a time, increasing the speed of your mixer gradually and this for 30 seconds each time. Proceed in the same way until there is no sugar left. Next, add the pumpkin puree, cinnamon and nutmeg powder. Whisk until all ingredients are well combined into the coconut cream. Place in the fridge for one hour to set. Spread the caramel between each cake layer ( only if making a 3 layers cake otherwise cut your one layer cake in half). 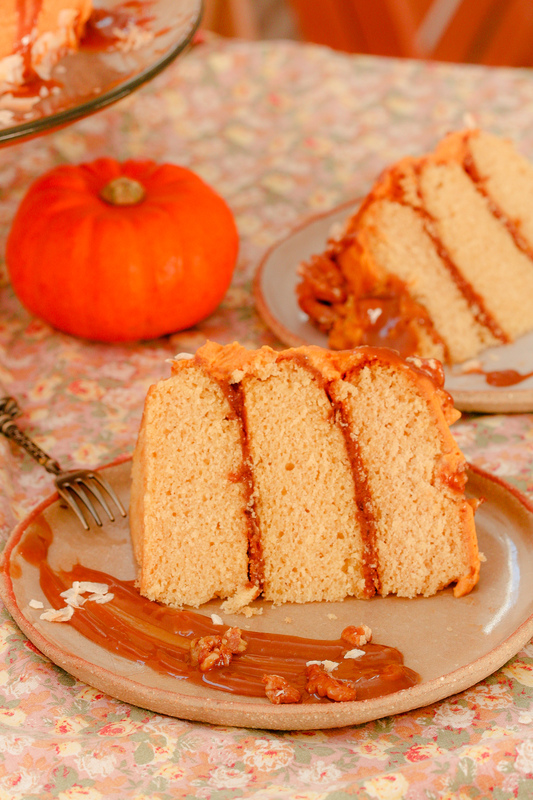 Then smooth the pumpkin filling over the top and all around the cake (using a spatula will make it easier). Add some caramelised walnuts on top. Simply roast a handful of walnuts with a drizzle of maple syrup for 10 minutes at 180 degrees Celsius. I love how creamy is the icing, the delicate touch of cinnamon and nutmeg go so well with the caramel in the middle.